Lives of the Spiders: Exciting news if you are a fan of dogs, and diamonds, and myth. Exciting news if you are a fan of dogs, and diamonds, and myth. 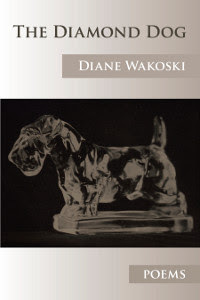 Diane Wakoski has a new book out from Anhinga Press. You can read about it, and read some poems here. I'll report back in more detail after I get my copy. I studied with Diane in the late 1980s, and she has a huge and wonderfully varied imagery collections in her bag of tricks. With some poets you say, "Oh, he's a nature poet---trees again," or "Oh, I get it, she does the gritty urban punk kid thing." Or, "Ah, yes, those stately images of Iowa farms, that must be the work of Gerhardt Dipthong." With Wakoski, you might encounter mythic beasts, or kitchen implements, or birds, or flowers, all in one poem. I will be interested to read this new collection, her first comprised of all new work in over ten years. I am looking forward to reading it, too. After I wade through "Middlemarch," that is. I just ordered it, plus three other poetry books. Curse you, internet--you make spending money so easy. I've always liked her poetry. She was an early favorite of mine. The internet does make it too easy.